Wow! Thanks for the great response everyone! My sister has sold tons of the kits! She is running a little low on things, but she would still like to sell the kits, so she is just going to need to raise her price a tiny bit. The kits are now going to be sold at $4.99, which is still a great deal!! So if she was out of stock earlier, check back now! :0) Thanks! My sister is the greatest!! So if you'd like to make one, head on over to her shop! Maybe if you guys like this option, I can do it with some other necklace designs in the future! That would be fun! How sweet is she!? I may have to jump over there & take a peek. I'm not a jewelry wearer but know plenty of ladies who are & would just LOVE this necklace. I just love your sister & her willingness to share!! And I just bought a kit! I think this is an excellent idea and love the thought of more!!! You two ladies R.O.C.K! Disney! I love working together with you and I am 100% for anything that helps the average women/mother/family save a buck! thats why I got into jewelry in the first place! I couldnt afford a nice necklace to wear out on a date with my husband! Greatest idea ever! I am totally buying RIGHT NOW. I was excited to make this, loved the price. And what a brilliant idea to make a kit! But tried to check out and found out it won't ship to Canada. I was SO delighted to read this and ran right over to the shop to see if she had any left (she did!). I thought the tutorial looked like something I could try, but wasn't sure where to get the supplies, and figured it would be expensive, so I just put it in the back of my mind.Thank you so, so much to both of you - I can't wait to make this beautiful necklace! Aww she sold out already :( I wanted to buy a few!! Hopefully she will add more soon! Yea! Just bought the kit. Now I am sure to make it since the supplies will arrive at my doorstep! That is amazing!! I can't wait to buy one and try it. 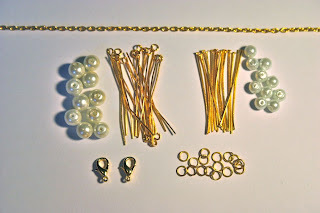 This is just what I need to get into jewelry making--well, this and your tutorial! Thanks! This is a great idea! I really wanted one but her shop is sold out. Do you know if she will be adding more? I love this! Thanks!! I ordered 2 this morning! Yes, do this again!!! What a fantastic idea....but your sister should definitely charge more! Your sister is so generous. I don't make jewelery, but I know a great deal when I see one! thank you so much for taking the time to say a little prayer for me!